Finished your settings? Create your first test job! Creating a test job is a great way to make sure everything is working perfectly before you start adding in real jobs. What is a job? Think of a job as a shoot. Essentially it's a folder of all the information you need for a shoot. 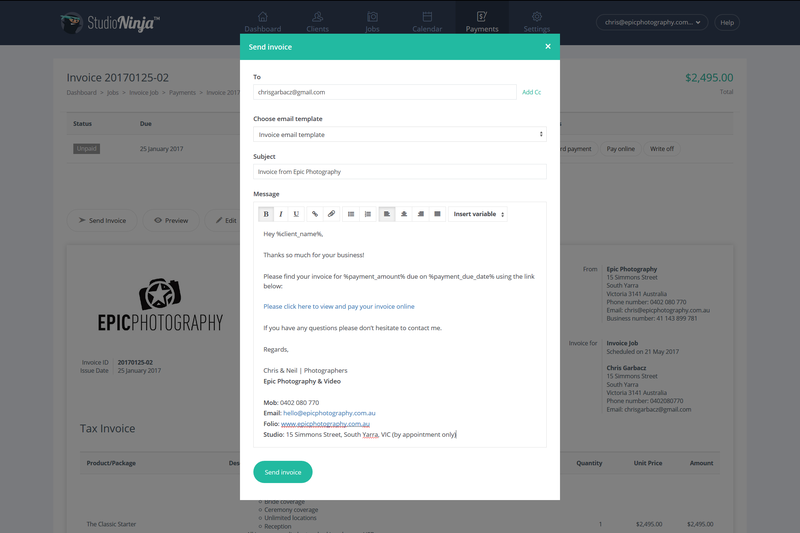 For example, Jenny & Matt's Wedding is a job and in this job you will find all the client info, job info, quotes, invoices, contract, questionnaires, notes, outgoing emails and a workflow status keeping everything neat and tidy and all in one place. Step 2: Add a new job! You can add a new job from several different places in Studio Ninja. 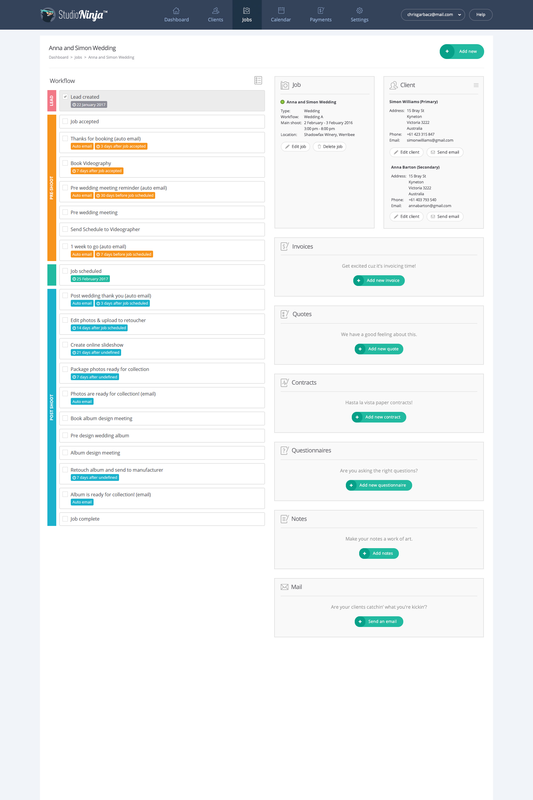 The Dashboard: Click the green 'Add New' button located within Upcoming Jobs and Appointment box. The Jobs tab: Click the green 'Add New Job' button. The Calendar tab: Click the green 'Add New' button OR click a date/time within the Calendar. The date/time will pre-populate the Job Schedule. The Client Profile page: Click the green 'Add New Job' button. The Client will automatically become the primary client for this job. Step 3: Complete the New Job lightbox. Select an existing client by typing into the input box or click the 'Add new client' button to create a new client for this job. Step 4: Add yourself as the primary client. Click the 'Add new client' button and add your name and email address, plus whatever other fields you would like to complete. This is where you give your job a name, for example, Jenny & Matt’s Wedding or Johnston Family Portrait. Step 5: Use the job name: TEST JOB. Step 6: Select a Job type from the drop down menu. To add, remove or edit Job Types go to Settings > Job Types. Click here to learn more about Job Types. Step 7: Choose the default workflow. To add, remove or edit Workflows go to Settings > Workflows. Click here to learn more about Workflows. This is where you choose a date and time for your job. If it's a wedding, you may want to tick the 'all day event' checkbox to block out the whole day in your calendar. Step 8: Choose any date and time but think of it as a real shoot, so the more realistic the better. If you don't have a date for your shoot, simply click on the 'No date has been confirmed yet' tickbox. 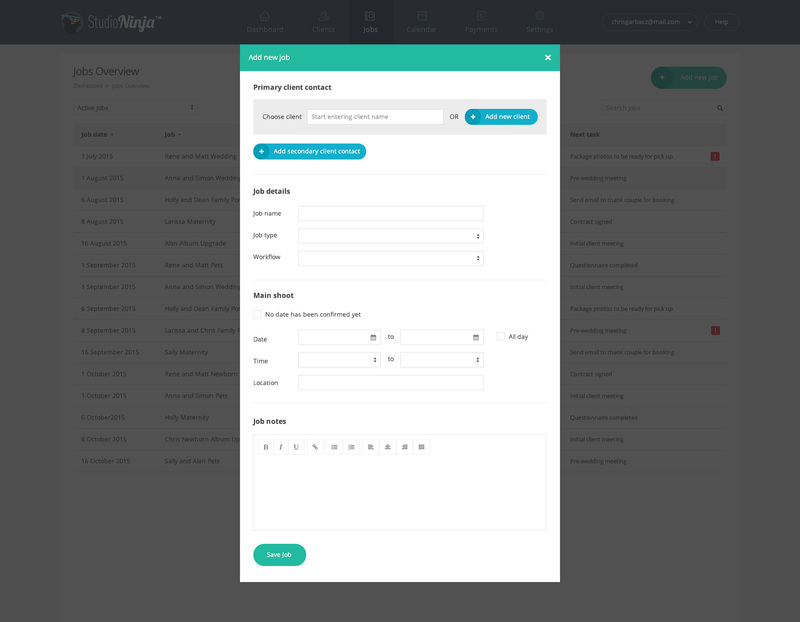 Lastly, this is where you add any specific job notes, for example, names of people attending the shoot, shoot ideas and inspiration, shoot schedule, etc. Congratulations, you've just created your first job! Welcome to the Job Profile page. This is the home of all the client information, job information, invoices, quotes, contracts, questionnaires, notes relating to this specific job. Whenever you need to do anything relating to this specific job, always come back to this page. IMPORTANT: Before creating and sending your first invoice, make sure you have gone through and completed all your settings. Now lets create your first invoice! Step 9: Click on the green 'Add new invoice' button on the right hand side inside the Invoice box. 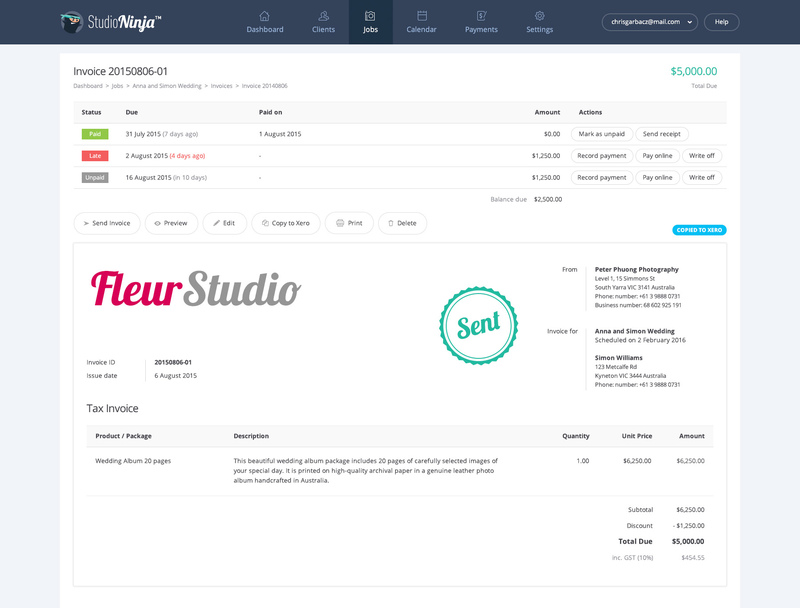 Welcome to the New Invoice page! Step 10: Choose a product / package from the drop down list or simply type in the fields provided. Step 11: Choose a payment schedule. Step 12: Choose a contract from the drop down list. Step 13: Choose a questionnaire from the drop down list. In this case, if you are happy with everything, click the 'Send Invoice' button and the Send Invoice lightbox will appear. By default the Invoice Email Template will appear so all you have to do is click the 'Send invoice' button. Feel free to make changes to the body text of this email to make it sound more on brand or permanently make changes to this email by going to Settings > Email Settings & Templates and editing the Invoice Email Template. Go and check your email. Open it and click the link that says 'Please click here to view and pay your invoice online'. You will now be taken to the client portal. 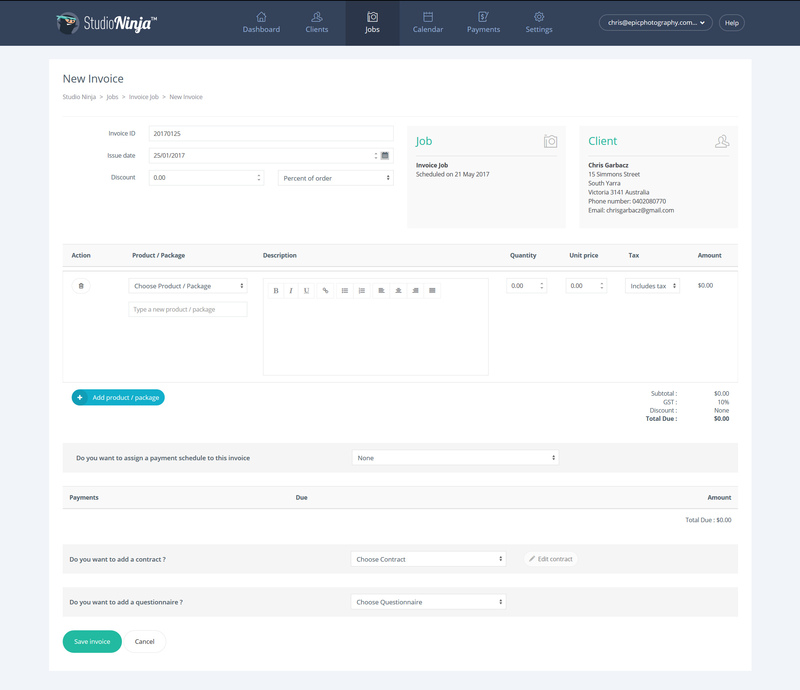 This is what your clients will see and this is where your clients will accepts quotes, sign contracts, complete questionnaires and pay invoices. Congratulations, you've just created your first job and sent your first invoice. If you are happy with everything, it's time to start adding real jobs into Studio Ninja!